Our Nurse Helen talked about Medications that are not available any longer ( a list of what was mentioned will be available here soon ) . We also talked about how AEDs work. There’s a really good film to watch by Epilepsy Research UK, presented by Chair of Trustees, Dr Graeme Sills, who gives you a clear picture of the type of drugs that are used in epilepsy and how they work. 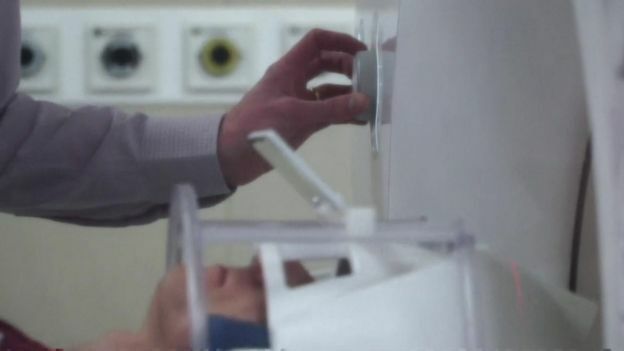 Fergus Walsh (BBC Journalist) volunteered for the project – not the first time his brain has been scanned, he says. The scan took around 45 minutes and seemed unremarkable. A neurologist was on hand to reassure me my brain looked normal. My family quipped that they were happy that a brain had been found inside my thick skull. But nothing could have prepared me for the spectacular images produced by the team at Cardiff, along with engineers from Siemens in Germany and the United States. 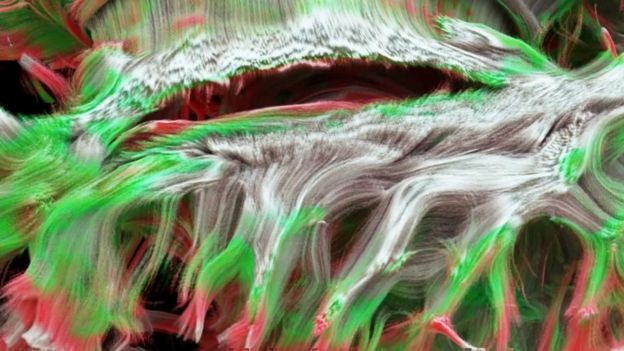 The scan shows fibres in my white matter called axons. 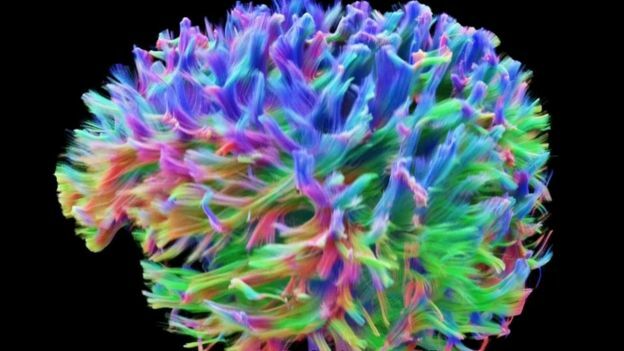 These are the brain’s wiring, which carry billions of electrical signals. Not only does the scan show the direction of the messaging, but also the density of the brain’s wiring. Another volunteer to be scanned was Sian Rowlands who has multiple sclerosis. Like me, she is used to seeing images of her brain, but found the new scan “amazing”. Conventional scans clearly show lesions – areas of damage – in the brain of MS patients. But this advanced scan, showing axonal density, can help explain how the lesions affect motor and cognitive pathways – which can trigger Sian’s movement problems and extreme fatigue. Prof Derek Jones, CUBRIC’s director, said it was like getting hold of the Hubble telescope when you’ve been using binoculars. “The promise for researchers is that we can start to look at structure and function together for the first time,” he said. The extraordinary images produced in Cardiff are the result of a special MRI scanner – one of only three in the world. The scanner itself is not especially powerful, but its ability to vary its magnetic field rapidly with position means the scientists can map the wires – the axons – so thinly it would take 50 of them to match the thickness of a human hair. The scanner is being used for research into many neurological conditions including MS, schizophrenia, dementia and epilepsy. My thanks to Sian, Derek and all the team at CUBRIC. D. WHAT IS THE VNS ? We talked about the benefits of the VNS ( Vagal Nerve Stimulator ) in Epilepsy. A few of the members of the group have it implanted. They talked about their own experience of it, whilst other asked questions. Our Nurse Helen explained what it did. Our Next meeting takes place in September, the 1st Tuesday of the month, from 7PM. We shall have a speaker from the hospital. More details will be added here soon. This entry was posted in epilepsy, meetings and tagged bbc radio, epilepsy, films, seizures, VNS on July 5, 2017 by Sam Downie.